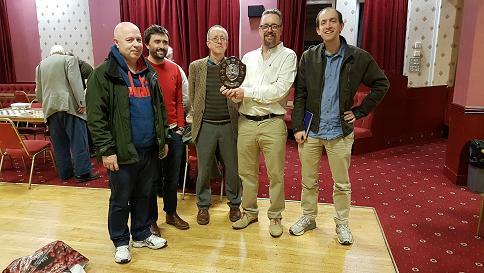 Leamington Chess Club have a spacious and comfortable room at the Oak House Liberal Club, 87 Upper Holly Walk, Leamington Spa, CV32 4JS. We play socially every Tuesday, year round, starting at 7.30pm. that runs between Binswood Street and Beauchamp Road. Leamington picked up a useful win in our quest to extend our top flite stay be another season. Andy got us off to a quick start, with a little help from his opponent, who blundered a rook and then resigned instantly. Peter, who was playing up in division 1 for the first time, started his game well, but allowed a passed pawn too much progress into his defenses. He had to resign after sustaining serious material losses. The top two boards looked less than promising for us in the early stages, but Morgan managed to win two pawns for the exchange, giving him a slight edge. The game eventually came down to an opposite-coloured bishops ending; these tend to be draws, but Morgan was able to force the sacrifice of his opponent’s bishop and round the remaining pawns up. As for myself, I was in a dreadful mess early on, but capitalised on a couple of mistakes by my opponent to win. That game is given below. The three finals take place on the same evening, and Leamington were in two of them. So, no losses at all, and two trophies … not a bad day’s work! Two games, with annotations by the winners, are given below. The A team’s best result for a while gives us a surprising win, our third of the season. It was a dramatic start for our newest member, Morgan appearing to be headed for a defeat as his opponent’s queen sliced through an open kingside to harass the white king. However, he found a bishop sacrifice which led to wild complications and, after Black had missed several chances to emerge a rook up, Morgan came out the exchange ahead and soon forced a resignation. The other games were less dramatic: Andy’s game was balanced throughout, ending in an opposite coloured bishop endgame; Ben kept the pressure on his opponent, who blundered in time pressure; I gave up a pawn for an attack which was difficult to stop (see below). Roy Hadfield has claimed the title over British Over 65 U150 champion, after scoring a splendid 4.5 / 5 at Warwick University. The B Team got off to a good start, with Ben Egid making light of a 31 point ratings gap to claim a quick draw against Dan. At this point, the other three games were all in the balance, but they ultimately turned our way. In my own game, David had handled the Elephant Gambit well, but made the crucial error of cutting off his knight’s retreat, allowing me to trap it. From there, it was just a case of swapping off pieces until the material advantage was irresistable. On board two, a French Defense was looking like a probable draw, but with the match in the balance Andy lept pushing for the win, and managed to win a bishop for two pawns. An unstoppable mate threat on the back rank finished things off. So the match was in the bag, but the last game stayed in the balance until the final seconds. Both players had enjoyed the advantage at times in the game, but Andy’s experience with the time scramble showed, as he was able to stop Alex’s attempt to sneak a rook’s pawn home. He had a decisive material advantage when his opponent’s flag fell. A deceptive final scoreline, then, but nice to start with a win. While my own game was actually the last to finish, it was all but over in the early stages, as I got into a tangle and allowed a pawn fork on two minor pieces. My opponent had some trouble finding the killer move, so I was able to get past move 60 before he finally finished it off. Fortunately, Ola didn’t follow his captain’s example, taking the initiative straight away and clinching the win in double quick time. Andy, in the meantime, had gone a pawn down, but a well placed rook helped him get the draw quite comfortably. All this meant that the result hang on what happened on board one. Dan took an early risk, sacrificing a minor piece to draw his opponent’s king out into the open. The mounting complications which ensued left both players struggling to make the time control. As move 35 approached, Dan had a slight edge, with a queen and several pawns against two rooks and a bishop. Disaster seemed to have struck when the queen fell to a discovered attack, but a few seconds later Black’s clock went, saving the win for us. Nerve jangling, but a win is a win! It was another tough match, but we kept our 100% start going. I didn’t get to watch much of Dan’s game, but he got a got the win thanks in part to a passed rook’s pawn. Steve came close to sneaking a draw, but a protected passed pawn near his king was too great a threat to overcome. However, Andy soon put us back in front. In an extremely sharp, tactical game, his opponent missed a resource which could have turned the game, before resigning with his flag hanging. My own game was a tense affair, as my opponent caught me off guard with an unusual response to the Morra Gambit. I was relieved that the match situation allowed me to swap off material and claim a draw. So, we’re top of the table heading into our month off. Ola’s win was aided by a rather odd move by his opponent, who attempted to capture one of his own pawns! While that move couldn’t stand, of course, the subsequent forced move did cost him a pawn. Ola was able to keep this advantage and ultimately win in a rook endgame. Andy had to do some defending in his game, but he eventually saw off the threats and swiftly turned things around to clinch our second point. Ben was looking for some revenge against an opponent who had bested him in a B Team match earlier in the season. His opponent actually refused a draw offer before entering complications which left Ben two pawns up in a minor piece endgame. Though short on time, he was able to push one of them through and get the checkmate. I missed the end of these two games as I was off trying to resolve a dispute in my game. After defending for most of it, I claimed a draw by threefold repetition: my opponent incorrectly claimed that the repetition had not occurred, but also correctly claimed that I had used the incorrect procedure. I had spoken the claim while playing my move, but should have written the move down and then made the claim without playing it. When we went back into the main room to check this, however, we found that the match was already in the bag, so my opponent sportingly didn’t enforce this and accepted the draw. Solihull B are the strongest side in the division on paper, but our B team had managed to get a surprise win over them a week earlier, leaving us a point ahead of them with a game in hand heading into this showdown. My own game was the first to finish. It started out as a very sharp Blackmar-Diemer Gambit, with both players missing chances for a winning advantage in the first dozen moves. Ultimately, I opted to allow simplifications to win my gambit pawn back, and was a dead draw after only 21 moves. Dan’s opponent opted a quiet opening, with an immediate kingside fianchetto. It was balanced throughout and soon ended in another draw. Ola had unfortunately gone a bishop down after an early miscalculation. He had some compensation in the form of an attack on his opponent’s castled king, but another slip at a key moment lost a second minor piece and proved decisive. Thankfully, Andy was able to produce an excellent win with the black pieces to tie up the match at 2-2. His comments on the game are below. So, a tense evening saw us lose our 100% record, but our slight edge at the top of the table is preserved. With a new look team, we were hoping to maintain our run of good form against Olton, a team who’ve struggled this season but who put out a team of comparable overall strength to our own. The game score doesn’t really tell the story of one of our more dramatic evenings. We got off to a bad start even before we’d walked in the door: as we neared our destination we were confronted by a traffic jam, as though the car drivers of Olton were doing their best to help their team … ! This served to make us 15 minutes late. Olton had started our clocks fairly promptly, so we had each lost about a dozen minutes by the time we took our chairs. Andy Price got us onto the scoreboard first, taking advantage of somewhat defensive play from his opponent to seize the initiative and win with a well executed attack, which you can see below. However, Olton tied things up soon afterwards. David made a few mistakes while rushing to make up for the lost time, ultimately leaving a rook hanging and resigning shortly afterwards. The situation appeared grim at this point. Andy was down to his last couple of minutes on the clock (his opponent still having about a quarter of an hour), and had dropped the exchange after missing a knight fork. I was also short of time, and defending a minor piece endgame a pawn down and with play on both flanks favouring his bishop over my knight. The chances of both of us salvaging the draws we needed to rescue a point from the game appeared slim. I think that I let the time deficit rattle me. I had made several indifferent moves after getting equality from the opening, and it took me three or four attempts to calculate the sum 7 + 15 correctly when resetting the clocks after the time control. As the end of the game neared some clarity returned, however, and I was able to give up my knight for his penultimate pawn, in such a way as to deflect his bishop for long enough for my king the round up the last one. A draw, then, but surely all for naught, as Andy was now down to about a minute left, and down a rook for only two pawns. He kept finding moves to make things difficult, though, and the time difference was slowly whittled away. Through some chess sorcery, he managed to reach a theoretically drawn rook vs pawn endgame. Black might still have had winning chances in a time scramble, but, perhaps affected by this sudden turn of events, he forgot about his own clock, and sat frozen for a full minute before his flag fell! An even narrower escape than at Shirley earlier in the season, then: the adrenaline rush of a rather stressful evening kept me awake until about 4am. And we do this for fun! Since our previous match, Solihull B had returned to the top of the table with two emphatic wins. We needed a win over their C team to top the charts at Christmas. My game, at 12 moves, is to date the shortest I’ve played at standard time controls. In defense of my opponent, we played couple of very even friendly games afterwards, so this can be taken as a one-off. The game is given below, as it is in a interesting line of the King’s Gambit. Andy Price was next to finish. The queens and rooks soon came off the board to leave an unusual end game with eight minor pieces having the run of the board. Andy was able to push forwards and gain space, but with symmetrical pawn structures a draw was always likely. Dan opponent started the game almost as badly as mine did, allowing a knight fork to win the exchange before move 20. Thereafter, however, he defended resolutely, and it took patient probing for Dan to break through with his rook in the endgame. Black lost on time with the game (and match) already in the bag. Andy Collins was faced with the unusual Bird’s Opening, which led to an awkward middlegame with locked pawn structures. A sudden shift of focus over to the queenside gave white what looked a decisive passed pawn, but Andy went into a queen endgame and used the threat of perpetual checks to stop the pawn. With a position that was still winning, but no time to make it tell, his opponent took the draw. Our biggest away win of the season has us finishing the season on a high, and hoping for more of the same after the Christmas break. With several players unavailable, the rematch with the had different line-ups, but a similar result, as close games went the way of the A team. Ola and Richard’s game didn’t lack for drama, as Ola picked up the exchange then gave it back. A sudden checkmating attack brought about a sudden end. The match on top board was less explosive, but a high quality encounter were a draw always looked a likely result. I turned down a draw in a closed position, as the match situation was still unclear. I then played some rather risky moves to open things up, which ultimately payed off thanks to the weak position of Tom’s king, a Knight sacrifice leading to a forced mate. That secured the match, but the remaining game went to the wire, as David managed to push a pawn to the seventh rank in a rook endgame. It was a tough position to defend, but Andy held the fort for long enough that David offered a draw with both players short of time. A good effort by all concerned, and hopefully the last internal match for a while. The A team have restored our three point lead at the top. The result could have been worse, as Dan was in a losing position, but won abruptly when his opponent misjudged a sacrifice and lost decisive material. Andy Price put a half point on the board in an even game where a draw always looked a fair result. The other Andy had coincidentally reached an identical position after eight moves, but his opponent managed to take a two pawn advantage into the endgame. However, after getting one of the pawns back, Andy was the recipient of a generous draw offer, which he took to ensure us a draw. My own game had looked to be petering out in to a dull draw, as the Queens came off early, but some aimless play let my opponent get on top, and eventually enter a winning king and pawn endgame. 20 minutes’ thought couldn’t find a saving line, and Fritz later confirmed that there wasn’t one. The drawn match leaves us now only 2 points clear at the top. The A team needed to bounce back quickly after last week’s dropped point. We took on an Olton team who we’d beaten by the narrowest of margins earlier on in the season, though both teams had changed line-ups this time out. Andy Collins was the first to finish … not surprisingly, as his opponent played at a lightning pace and built up an advantage of some 45 minutes on the clock! The more measured approach payed off, however, as Black’s queen dropped in a sharp position, putting us 1-0 up. The other Andy’s opponent was rather less aggressive, adopting a hedgehog defense and conceding masses of space on the kingside. This proved decisive, as Andy had no trouble building up a brutal attack on the uncastled black king. I didn’t see Dan’s game, but it looked like he had to work hard for the win, as he gained a pawn in the endgame and made it count when it was only kings and pawns left. Not for the first time, I found an opponent who was unfamiliar with the Elephant Gambit; he actually played decent moves, but fell behind on the clock. I eventually broke through on the queenside, but couldn’t finish the job and had to enter a rook endgame one pawn up. My opponent let me trade off the rooks, making my job easier. So our first 4-0 of the season: a welcome boost to our tiebreaker in an extremely close race for the title. Kenilworth B had done us a massive favour since our previous game, beating Solihull B despite being a man short. This left us four points clear with four each to play … Solihull sent a strong C team, however, to try and help their clubmates. Dan, playing a Sicilian Defense, got into some trouble, and was actually losing when his opponent offered a draw. Dan had a rook for two knights and would have lost several pawns if White had played the best continuation. The other three games were in the balance at that point, but they turned in our favour one by one. Andy Price was the first to make the breakthrough. He held a slight positional edge for most of the game, ultimately exploiting the weak squares in his opponents camp to infiltrate with his queen and decisively win material. Andy Collins clinched the win, in a finely balanced game where all three results were plausible for most of it. The telling factor was the pressure on White’s knight on f3, pinned and attacked multiple times. Its eventual capture soon triggered a resignation. Ola started well, gaining space in the middle and the kingside. The position became very blocked, however, and Black’s queenside counterplay became dangerous. Ultimately, Ola’s rook and bishop broke through, winning too much material for his opponent to have serious chances of a comeback. So, despite (or perhaps because of) the captain being rested, the A team temporarily go six points clear. There’s now over a month off before the final three games. Results involving other teams having continued to go our way, we came into this game needs only a single point to clinch the title. Dan’s move to Ireland did make our task a bit harder, but we were still able to field a strong team. Andy Collins set us on our way with a quick win. His opponent, playing the Pirc, made some unusual choices in the opening, giving White the opportunity to build some serious pressure on the f-file. An unshakeable pin on the f6 Knight gave Andy a material advantage that he converted into a win without alarm. The other Andy, playing against a higher rated player, had no problems maintaining equality; a draw was agreed in the early endgame with a totally balanced position. The honour of clinching the title fell to Ola. Playing with two bishops against two knights from early on, he pegged White’s forces back around his king. Patience was required, but eventually Ola won the exchange, and more material gains were to follow. He was up by a clear rook when the resignation came. My game was interesting, being one of the sharpest lines of the Elephant Gambit. My opponent opted to give up a knight for three pawns, an imbalance which looked likely to lead to a win for one of us. I eventually gained a pawn, but my opponent offered me a draw shortly afterwards when the match was decided. While I felt able to win – and subsequent analysis showed that my chances were better than I had realised – I was happy enough to accept under the circumstances. Champions then! A great effort by the team to put right what went wrong a year ago. With ten wins and two draws, our only remaining challenge is to try and finish unbeaten. Jason, playing his first A team game for a while, continued his excellent season with an easy draw with black, gaining some initiative before his higher-rated opponent agreed to the split point only ten moves in. I was less successful, and found myself defending in a fairly unexciting position. A bad decision to trade rooks left me in a bad minor piece ending, and his bishop ultimately trapped my knight. Andy Collins added a draw. His opponent conceded the exchange but gained space on the kingside where both players had castled. Nlack held things together until Andy had to take a draw due to lack of time. The other Andy was playing in an even game; he might have agreed a draw sooner than he did, but played on until only kings and pawns remained to try and save the match. So, the first loss of the season, but we won’t lose too much sleep over it under the circumstances! We started our final game of the season with a couple of new faces among our ranks. Bogdan was playing in his first graded match, and looked in trouble as he went two pawns down. However, he out-manouevered his opponent in a queen and rook endgame, picking up the black queen with a fork. 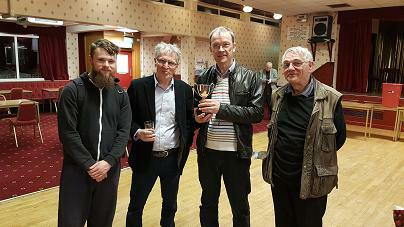 Andy may have been disappointed with the draw, given the grading gap, but it isn’t always easy to push for a win with black. The position was dead level when the players shook hands. I clinched the match win while avenging a defeat to Kim back at the start of the season. It was quite an interesting game, given below. Sumiran’s game took longer to finish, but he steadily gained material throughout, and brought our season to an end with a neat checkmate. The final match stats: 11 wins, 2 draws, 1 defeat. The final game stats: 30 wins, 20 draws, 6 defeats. Now we just need to replicate that up in division 1! The Warwickshire Open is an annual event, consisting of three rounds on the Saturday and two more on the Sunday; a potential seventeen and a half hours of play over a single weekend makes for an exhausting but enjoyable challenge. There’s usually a good turnout of Leamington players at the event; eight this time. While none of us won any prize money this time around, everyone was around a 50% score. This game of Tom’s was an enjoyable swindle to finish on 3/5 in the major. Leamington B lost narrowly, but there was a rare win over a player graded 190. While a couple of close games on boards two and three saw promotion rivals Solihull B claim the win, Ben overcame a ratings gap of 42 points for his best ever win.